My last post concerned my Wipeout collection. As any Wipeout fan is aware, when it comes to getting champion track times, the 4-way digital pad is out. But when the original Playstation and Wipeout came out, that’s all there was, you’re thinking. Dual Shock wasn’t even a glimmer in Kutaragi’s eye. Well, there was one alternative: the NeGcon. 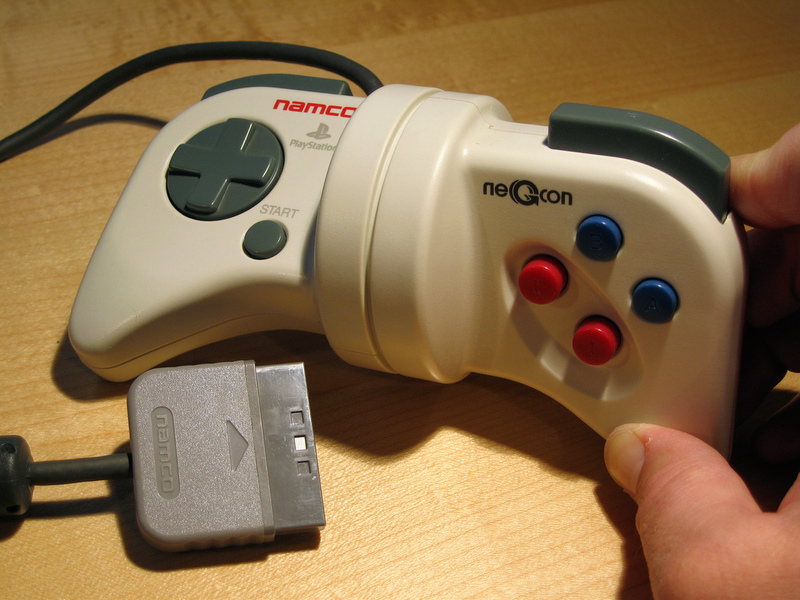 Perhaps the most unique controller I’ve ever encountered, the NeGcon was a Playstation controller put out by Namco which featured most of what the standard Playstation controller had to offer, with the notable addition of an analog “steering” style control in the form of a split down the middle of the unit, with the left and right halves connected by a swivel-joint. What’s more, the left shoulder button as well as the front X and square buttons were analog with a notable travel distance to them. The player would twist the unit to steer his or her craft while applying the desired level of thrust to the analog buttons. A player’s potential performance, when armed with the NeGcon in a game like Wipeout, is far beyond that of the unfortunate player chained to a D-pad. A number of games supported this controller early on, among them: the entire Wipeout series, Gran Turismo, and the Ridge Racer series. The NeGcon was never a well-known controller, but there are players who, to this day, consider it to be the superior analog controller for the Playstation. I’m pleased to have found one back in ’96 at a local toy store. I never play Wipeout without it. I prefer the neGcon to a steering wheel. My times on GT2 are unbeatable compared to a standard controller. Despite what others might say, I find it quite comfortable to use. I use a different grip. Most people will use it in a similar way to a standard controller. I turn the neGcon so the buttons are facing away from me, with the handles pointing up like horns (with the cord exiting toward the floor). I use my right index finger for the “I” button, and my right middle finger for the “II” button, while my thumbs sit on “top” of the controller between the “horns” and the swivel. This not only allows more precise control of the “I” and “II” buttons compared to using your thumb (and also the ability to accelerate and brake at the same time), but also allows more precise steering because of the full palm grip. I am heart-broken that the GT3 and GT4 games do not support this most unique and excellent contoller. I actually tend to play GT and GT2 more than GT3 and GT4 for this exact reason. I’m one of the (very) few who discovered this controller and was gutted when games, especially GT, stopped supporting it. With only USB connectors on the PS3, the final nail goes into the neGcon’s coffin. i have played some racing games with it (for simulations i prefer a steering wheel), but it definitely feels like it was made to be together with wipeout (specially xl/2097), more than any other game. Definitely one of the best specialty analog controllers made to date (and if i had to choose a favorite controller overall, this would probably be it).